My home is 6.2 miles from the Rose Bowl. That means that I travelled less distance driving to and from the event than I did actually racing it. Sweet. I got to the race WAY too early- 5:15 and it was COLD. Probably one of the coldest race mornings I’ve been to. I had four layers of shirts/sweaters on and was still shivering. But by the time we were ready to start the race I was able to drop 2 layers and it was just warm enough to be comfortable. I went out too fast for the first 5 miles or so. I knew I was going too fast. I told other people from Disney near me “I am going too fast and I am going to crash near the end.” Did I slow down? No. I knew better, but still didn’t do anything about it. My friend Jana came out for support and saw me at mile 4, and told me she would have a Mtn. Dew for me when I looped back around mile 8. Let me tell you, there are few things more motivational than knowing you have a cold citrusy delicious Dew waiting for you. I started looking for Jana around mile 7, and then at one point I saw a woman in light blue t-shirt about a block away. Well actually, with my eyesight all I could make out was a splotch of blue, but next to that blue was a glowing spec of neon green. My Dew! I took a few gulps, it was delicious. Jana told me to take the bottle with me and I REALLY wanted to, but I knew I would have just chugged the thing and gotten sick on it so I wisely returned it. Things didn’t really fall apart until mile 11 or so, where I just stopped running completely and stretched out for a bit. It’s a shame because I was so close to the end, but the legs just weren’t there anymore. Still, I don’t think I walked more than 2/10 of a mile total, so overall it wasn’t bad. I predicted a 2:20 finish time and came in at 2:17. It was not a great race time-wise, but considering where I am in my training I was actually very happy. My longest run in 18 months was last week’s 10-miler where I was having some foot problems, but everything seemed to be OK today. This was my first “Rock n Roll” race. Overall, I liked it. Parking was a breeze, there were porta-potties-a-plenty, and everything just seemed to run smoothly. If there was a weak part of the race it was, ironically, the music. Maybe Pasadena has a noise-ordinance, but the bands along the course did not seem very loud to me. And some of the songs they were playing when I went by seemed kind of mellow. I’d much rather have a DJ playing high-energy songs to get me going. There was however a traditional Asian drumming group around mile 5 or so and they were very cool. Also, all of the local school cheerleading squads were great. OK buddy... First of all, I don’t know how many races you’ve done, but this ain’t my first rodeo either. I know a thing or two about recovery, and there is nothing wrong or unusual about being sore after a race. Second, there is absolutely no reason for you to be stretching for 30 minutes after a half marathon. Come on. Seriously? After you cross the finish line, walk it off for a few minutes then hand in your coupon for a free drink in the beer garden. Done. I didn’t have much of an appetite so I nibbled on a burger, but as we were leaving they had a tray of free chocolate chip cookies. They were soft and chewy and were covered in large chunks of... salt. Yes, salt. Now I don’t know if this is just the dehydration talking but those cookies were AWESOME. I should have skipped the burger and just chowed down on the cookies. Amazing. So overall, a fine day. The Agoura Hills Half Marathon is next month, and it’s a lot hillier than Pasadena. It’s on the radar, but I’ll recover for another day or 2 before I make a decision about doing that as well. So this is weird... I lost my running shoes. On Sunday, I had to do a 10 mile run. I wanted to run during the warmest part of the day, which I figured was around 2:00. I slathered myself with bodyglide, slipped into some warm spandex and then... where were my shoes? I spent a half hour looking for them. In closets, in the car, under couches... nothing. I remembered the last time I wore them was at the gym, and I went during my lunch hour at work so I changed out of them. I must have left them there! I drove to the gym, and figured I’d pick up my sneakers and head straight on over to Griffith Park for the run. The guy at the gym asked me what color my shoes were, and I was a little embarrassed: “well, they’re white but they do a LOT of trail running so they’re pretty dirty.” He pulled out a pair of white shoes that looked like they came straight out of the box and asked “these?” I should have just said “yes” and taken a brand new pair of shoes, but I didn’t. I told him “no, you will barely be able to tell that the shoes are white, they’re that dirty.” They didn’t have mine. So it was back home for more searching. Finally I just gave up and decided to use my old shoes. They still had the tag from the Pasadena Marathon... 2011. I was not thrilled with the idea of switching shoes right before my longest run in 20 months, but I was less thrilled about not doing my long run one week before a race. Gotta be honest, it hurt. My legs did just fine, but my ankle was not happy about it at all. And I guess these will be the shoes I wear for the Half Marathon on Sunday, and then I’ll go buy a new pair. But it just drives me crazy that I could lose a pair of shoes. I just watched "The Loneliest Runner". It was a made-for-TV movie from 1976 about - I'm not making this up - a teen bedwetter who grows up to become Olympic Marathon gold medalist Michael Landon. (No spoilers, all of this is revealed in the first 10 minutes.) 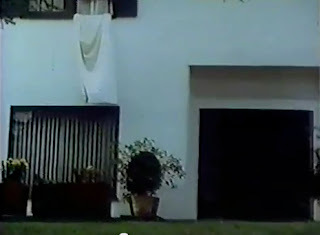 Basically, the kid's mother hangs his stained sheet out of his bedroom window in an attempt to shame him into breaking the habit. So the kid runs home after school every day to remove the sheet before any of the other kids in see it and - ta da! - becomes a fantastic runner. This movie has always had a special place in my heart. No, not for THAT reason. When I was 8 (and fully in control of my nighttime bodily functions), my grandmother took me from New Jersey to San Francisco to visit some relatives. And while there, we watched this movie. There are a lot of scenes that I still remember well, but some have special meaning upon seeing them again. 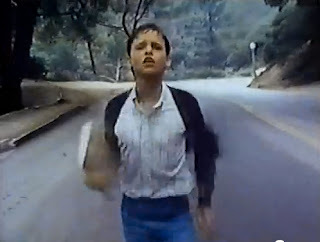 There are some running scenes which I now know were filmed in Griffith Park (I don't think the most direct route from school to home would be past the Observatory, but who am I to judge.) I have biked and run on these roads may times, so it's kind of cool to see them on TV. 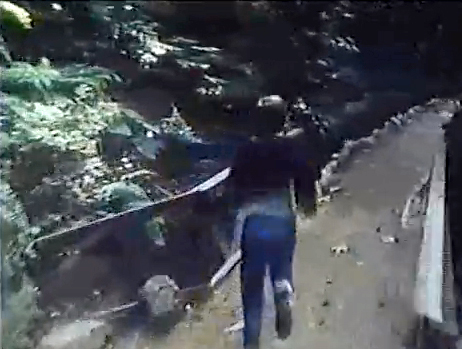 There is one place that I don't recognize though - the kid runs down a path into the woods across bridges and it looks really cool. Does anyone know where this might be? I want to go to there. It's not like I'm recommending this as a good movie. But if are of a certain age, and can remember the angst and drama of 70s television, it's kind of interesting. Several months ago, I signed up for the Rock-n-Roll Half Marathon at the Rose Bowl. I thought it would be a convenient race to get back on the training wagon. Unfortunately, I didn't start running with any sense of regularity until after the new year. So I am a bit behind. I'm on a bit of an accelerated training program to get my mileage up. My concern isn't about having a good finish time (well, that is always a LITTLE bit of a factor), but avoiding injury. I've had problems in the past when I started upping my mileage too quickly. My longest run in the past 18 months was the 80s 10K in October, so I'm a bit out of practice. The goal was to have a long run of 8 miles last week, 9 miles this week, 10 next week. Then I'll have 2 weeks before the race. I did the 8 miles last Sunday. When I started, my left shoe felt a little tight but I just thought it would loosen up as I ran. I have no idea why I would think that. If anything, my feet would probably swell and the shoe would get tighter. Sure enough, around mile 5 or 6 I was starting to feel it in the behind-the-ankle-above-the-heel area. I thought to myself, "I should adjust my shoe" but I was already a little tired and just didn't want to deal with it. Yes, I was too lazy to stop running. And by the end of the run, my foot hurt. My foot hurt Monday. My foot hurt Tuesday. At this point, I was a little concerned so I decided to self-medicated myself. And by that I mean I wore my Crocs to work. Now I know their are a lot of Croc haters out there but I am telling you, you are morons. Nothing will feel better on your feet then spending the day in Crocs. And it's not like I was wearing a pair with lots of holes and bling buttons attached - these were my Uptown "dress" Crocs. Do not Mock the Crocs. By Wednesday I was able to do 5 miles with a little bit of pain. More discomfort actually, so I think I was doing OK. I intentionally waited until Sunday to do the inner, to give my foot the most time to heal. Today is Super Bowl Sunday. That means nothing to me. And I'm one of those weirdos who would rather run when it's too hot than too cold, so I waited until the afternoon to do my run. Unfortunately, I grossly underestimated the amount of time it would take me to run 9 miles, and grossly overestimated the time of sunset. The sun slipped below the mountains with about 4 miles to go, went under the horizon with 3 miles to go, and I was pretty much running the horse trail in Griffith Park in darkness for the last 2. I had the lights of the freeway for part of the way, but that basically just gave me night blindness so I could not see the ground at all. And the trail is very lumpy and uneven. It was a bit disconcerting. I'm sorry to say I made it back to the car without incident. No interesting stories of twisted ankles or being attacked by coyotes. There is a very slight pressure behind my ankle now, but nothing to worry to about. I'm not going to set any PRs at the race, but I should finish it OK.